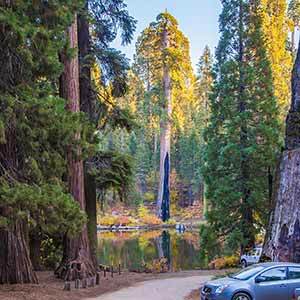 Located on a mountainside high above Camp Nelson, a little-used and mostly level dirt road winds for nine miles through the attractive Black Mountain Grove of giant sequoias. 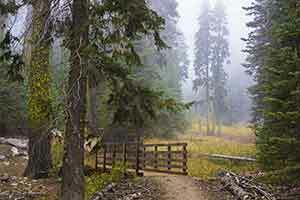 The road is well-maintained and can be explored by car, on foot, or any combination of the two. 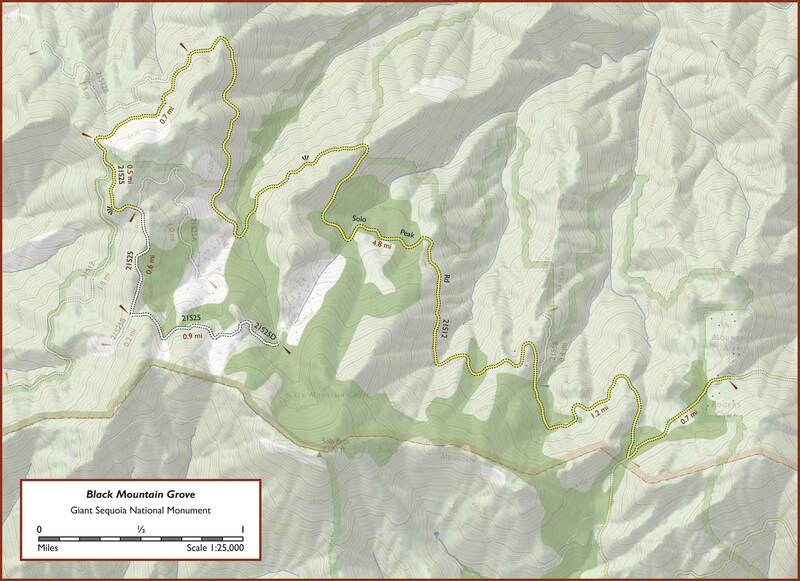 According to a Forest Service inventory completed in 2009, Black Mountain Grove has the highest density of large sequoias (29 inch diameter and above) of any grove. 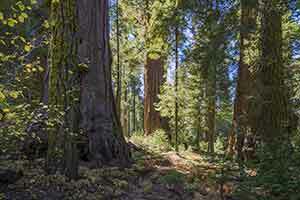 The redwoods are mostly confined to a series of sheltered ravines. 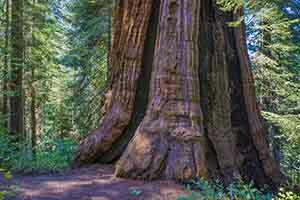 As a result, the roadside scenery is mostly ordinary non-sequoia forest, but with an occasional sequoia-filled ravine. 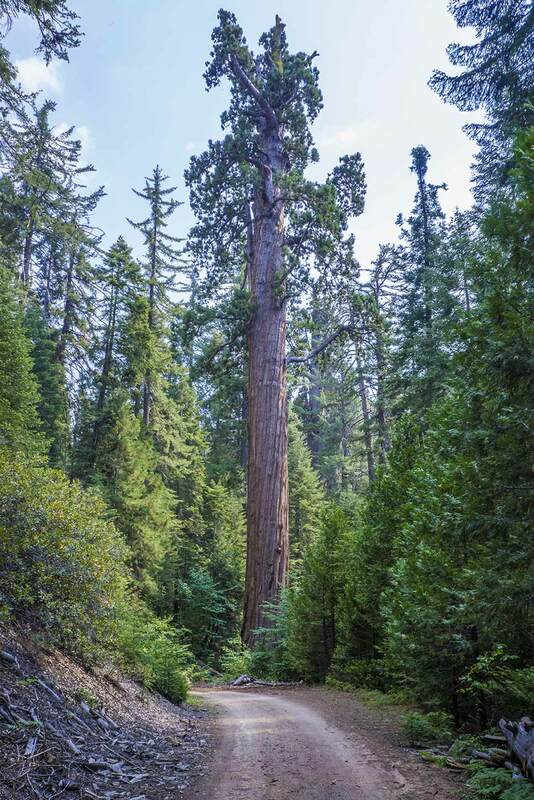 The patches of old growth, though brief, are quite scenic; the sequoias tend to be really big, and in each ravine a few immense trees stand right next to the road. The wide open swath that the road cuts through the forest makes it possible to see the full height of many of these trees but, on the other hand, also isolates you from the forest; it feels like you’re passing by without really entering it. 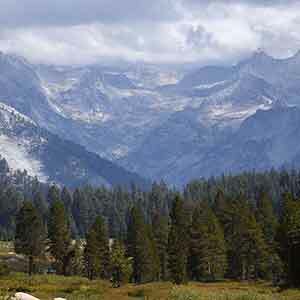 The sequoia forest is essentially the dense, low-elevation type. Although it’s not as lush and green as lower-elevation groves, it has a typically dense understory of pines and even, in a few spots, a groundcover of ferns. The grove was heavily logged in the 1980s, but for the first five miles the woods are mostly in excellent condition and show little or no signs of logging. The most visible logging is concentrated in several clearcuts at the far end of the road. The grove is very isolated and quiet. It’s also little-visited; even if you spend all day there on a summer weekend, you probably won’t see anyone else. However, cows graze within the grove and there’s a lot of manure on the road. For completeness I’m including the entire road in the description below. However, hiking the whole road would be a little dull since most of it isn’t in the sequoias. 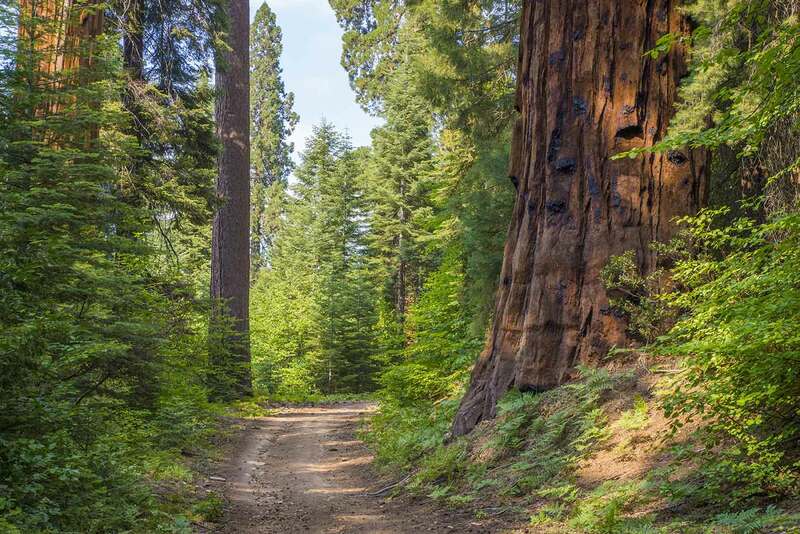 On the other hand, driving through the whole grove isn’t the best option either; the bands of sequoias go by too quickly, and the most impressive sights are above you, so you can’t see them from a car. A better option might be to drive to the best parts of the grove and explore them on foot; biking, which I haven’t tried, might be even better. 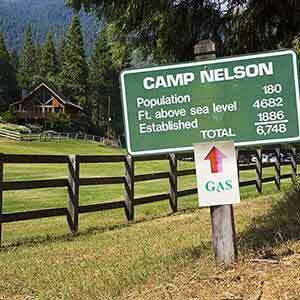 Directions: from Camp Nelson, take Coy Flat Road. 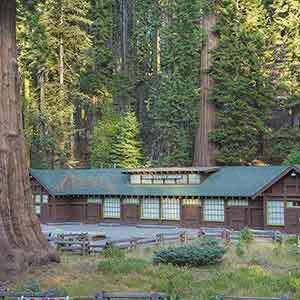 The sequoias begin just past the gated dirt road with the "Mountain Aire" sign (Rogers Camp). There are occasional wide spots in the road where you can pull off and park. 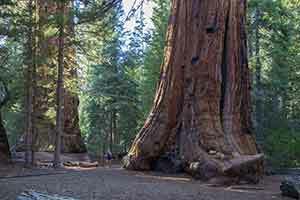 As it enters the grove, the road passes through a smattering of large sequoias before reaching an intersection. Ahead, the road enters an Indian reservation and is marked "no trespassing" (just inside the reservation, though, it descends through an exceptional stand of sequoias, one of the best on Black Mountain). Turn right at the intersection. The road descends slightly; although it doesn’t gain or lose much elevation, it undulates gently up and down for its entire length. 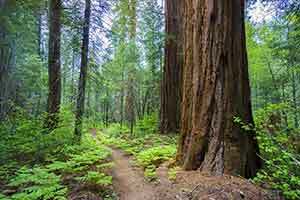 The road passes through two small bands of sequoias and then enters the largest and most scenic stretch of old growth at about 3.5 miles. 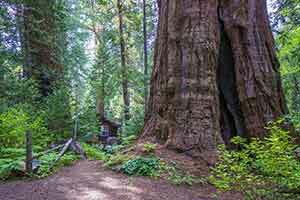 There’s a noticable change in the forest here; the trees, even the non-sequoia trees, are much taller, the forest more lush and shady. 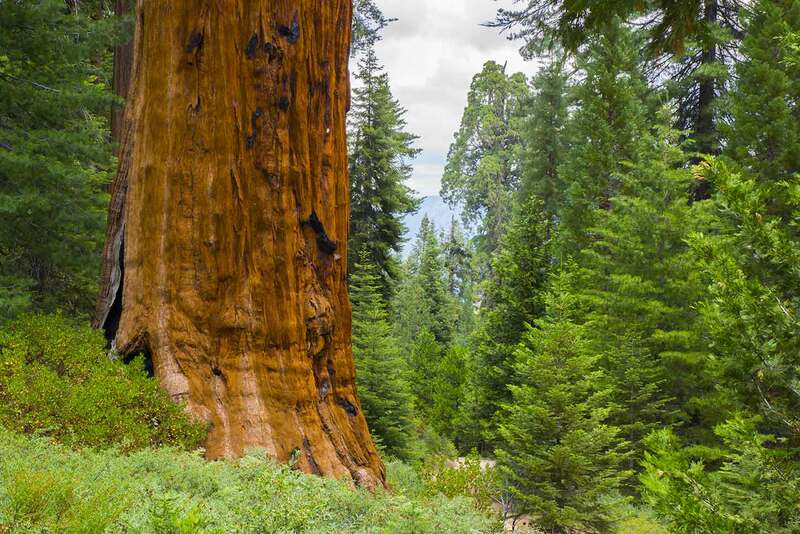 The sequoias are quite impressive. If you’re driving to this part of the grove, look for an open gate across the road; it marks the beginning of this band of old growth. As the road leaves the grove it passes by a clearcut, the first real sign of logging. The road then winds through ordinary pine forest for a while before reaching the next band of sequoias at about 5 miles. Although it’s small, the trees are the most impressive so far; there are about a half-dozen huge trees around the hairpin turn in the road. 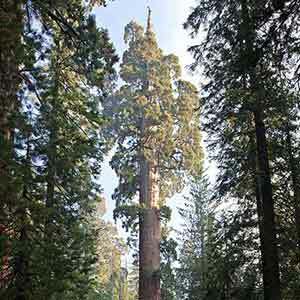 This is the last significant band of old-growth sequoia forest on the road. For several miles the road winds through ordinary and rather dry-looking forest, then it begins a gentle climb into the upper grove. 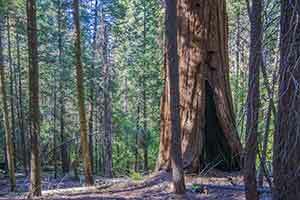 The sequoias in the upper grove tend to be isolated and widely scattered, and there are a lot more signs of logging. 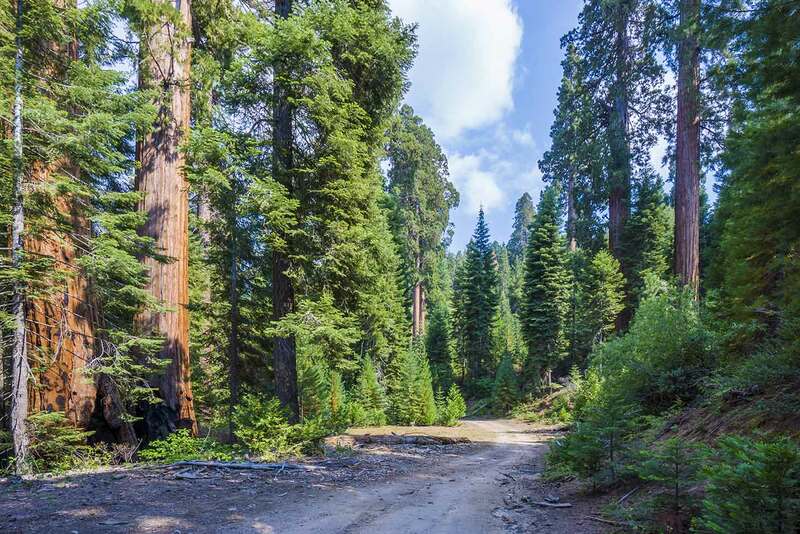 At the unmarked intersection with road 21S25A, you can go either way; the left-hand road is more heavily-used, but the right-hand road has more sequoias. Both roads gradually become rougher and more difficult to drive. 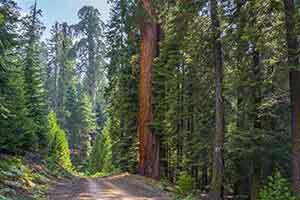 Each leads to a clearcut populated by immense sequoias that stand oddly exposed. All the non-sequoia trees in these clearcuts were logged, and even though it’s been 30 years, the regenerating trees are still little more than Christmas tree-sized; some areas are still brushy and don’t have any trees at all. Despite the unfortunate way that they were created, the fields of immense, widely-spaced sequoias standing against the conifer-clad backdrop of Black Mountain are actually quite a striking sight. A small, lush band of old growth in a ravine next to the upper clearcut serves as a reminder of how attractive this area might once have been. 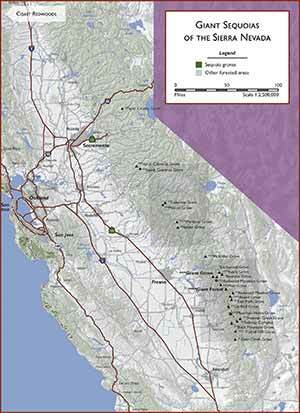 The Visalia Times-Delta has an excellent article on the grove.